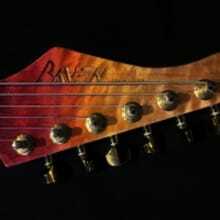 Raven Guitars Tech Europe is a guitar design studio and guitar store in the Netherlands, focusing in designing and selling high quality guitars. 2. Stephallen Custom Works, modern style custom guitar. Headless, 7 strings, synth, we have them all. Made in Indonesia/The Netherlands. 3. RDK Custom Works, radical design, a blend between vintage look and modern playability. Made in United Kingdom/The Netherlands. All of our guitars are powered by custom wound 4 Seasons Pickups (unless stated otherwise) that are tuned individually to match the wood of the guitars.